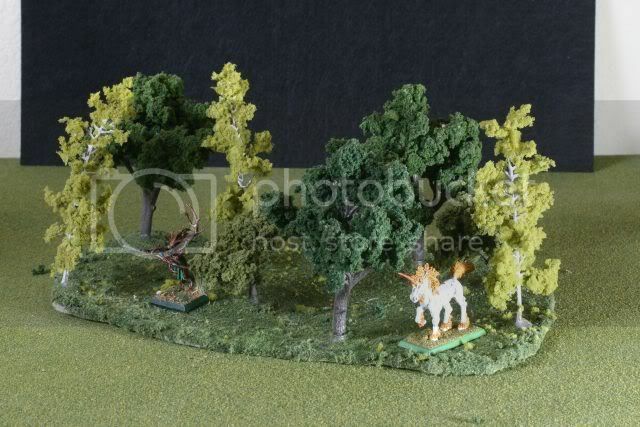 I'm creating this thread for everyone to post pictures of WE terrain pictures and/or Terrain Lists/Charts. 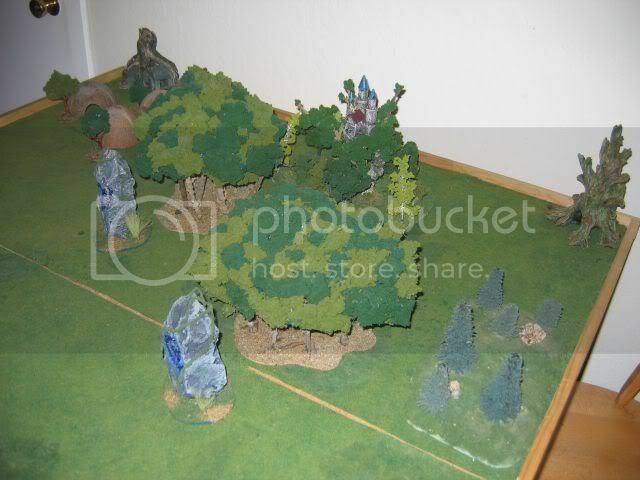 I used to keep this "project log" over another site, which now is pretty dead, so I am moving it here, with the addition that I would love to see everyone's else ideas and pictures for terrain or how they see Athel Loren. Scarce (note I’m trying to keep any real “woods” out of this category for the sanity of my opponents). 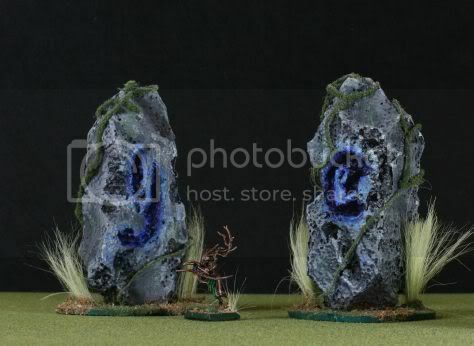 Way Stone – (arcane Monolith and see see below) impassable. 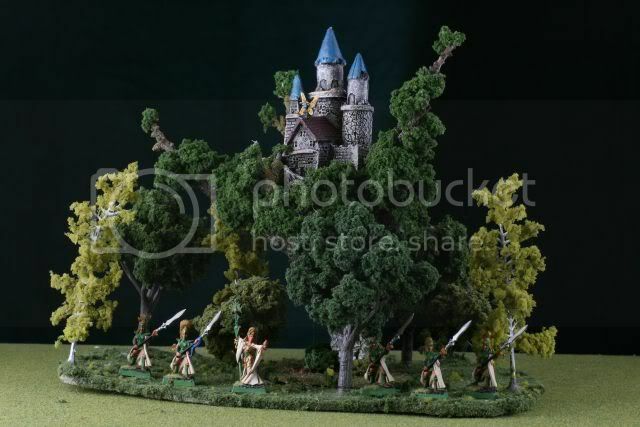 Overgrown Ruins – Difficult terrain, hard cover. 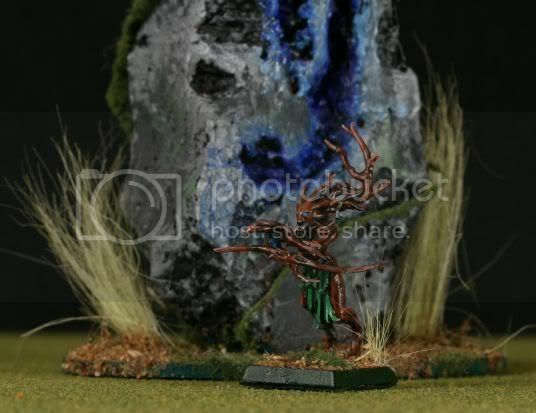 Waystones: I was going to use the basic arcane monolith rules (extra magic dice) and additionally state that Forest Spiritis within 6” are subject to stupidity but gain MR +1 (additive to what they already get), thoughts? 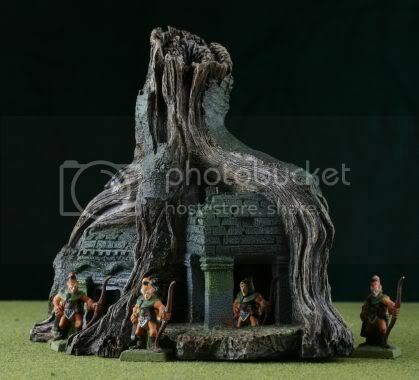 Elven Hall: This is an opening to a great elven hall, It acts like a small building, but there is no limit to the number of models that can be and or shoot from inside. Basicically there is a large underground space with potentinally lots of sneaky shooting holes. Spite infested Grove: This grove is the home of a colony of mischievous spites who may or may not welcome any intruder , roll a dice for the first unit that enters or is deployed here. 1. They Hates you – your unit takes 2d6 S2 magical Hits. 2. Hey that not my shadow!?! Ahhh - the unit must take a terror test. 3. They want to play- The unit looses all sense of time and distance as the woods twist and turn around them. 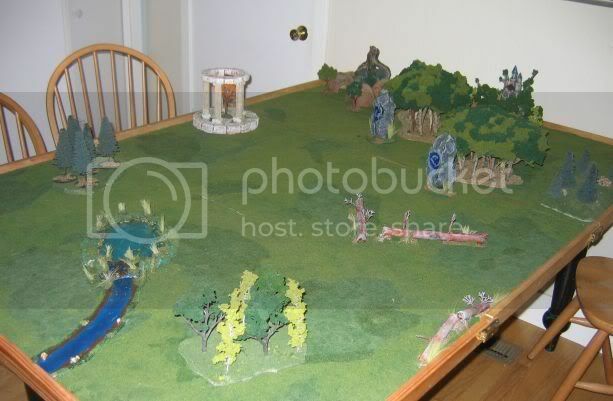 Remove the unit from the table. 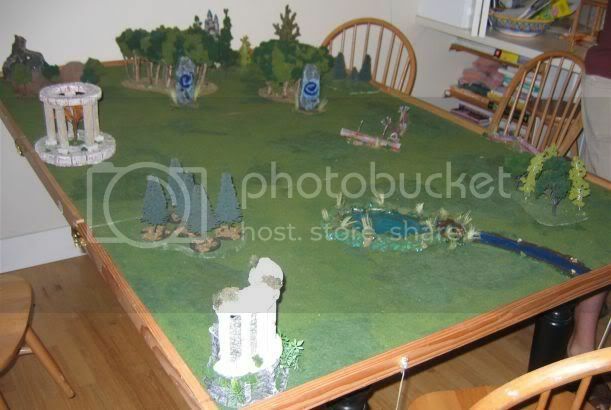 The must roll a 4+ at the beginning of each players turn to come back. Once back They may be placed anywhere in in any woods on the table. 4. 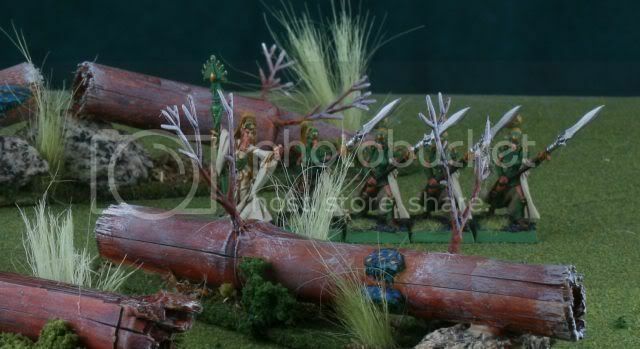 You amuse them- the spites swarm around you for the rest of the battle, all attacks are considered magical. 5. 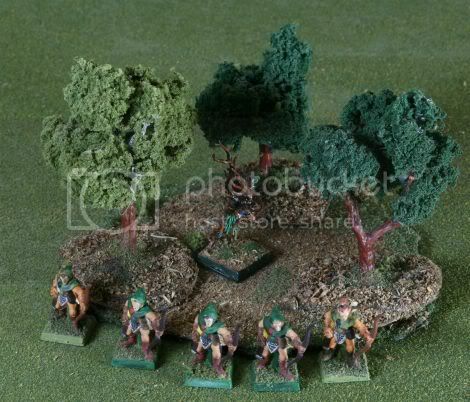 Little Buddies, The Spites go along for a ride adding d6 S2 magic attacks per combat phase until the unit losses a round of combat. 6. Wish Granted, you may freely cast one spell of your choice from the lore of Athel Loren in your next magic phase. Note that the Top comes over to you can mover your skirmashers through them. 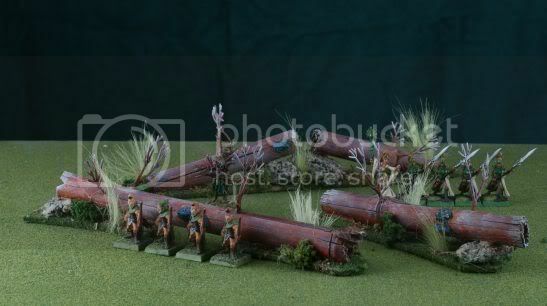 Fallen Logs, these are the 3 I have made, the log is a piece of bamboo. 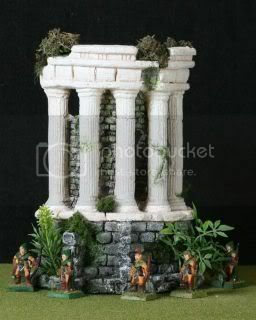 Overgrown ruins, Aquarium decorations with some added painting and flock. 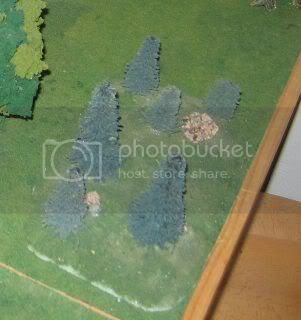 Wooded Hills - nothing too fancy, Coniferous tree bases on my standard hills, I need to finish painting the tree bases. Spite Infested Groove, This is a single tree that drops into one of my other Woods. 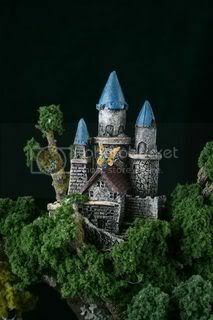 The castle is an aquarium piece. The spite is a warmaster witchelf with some green stuff. I need to add a few more of those . 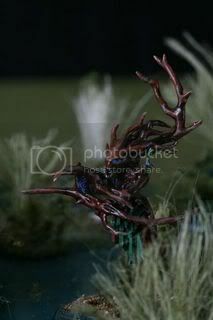 . .
Sylvan Idol, This doubles as a High Elf Shrine to Isha. 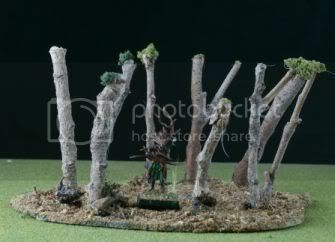 And in Athel Loren it could be a reall really old shring, when I use it I will add some more tree and grass bases around it. I need to take another photo like that. 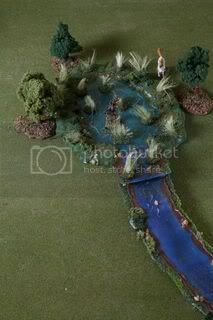 . .
Meadow Lake, I've got a hole set of river sectinos that will lead from the lake to a table edge. 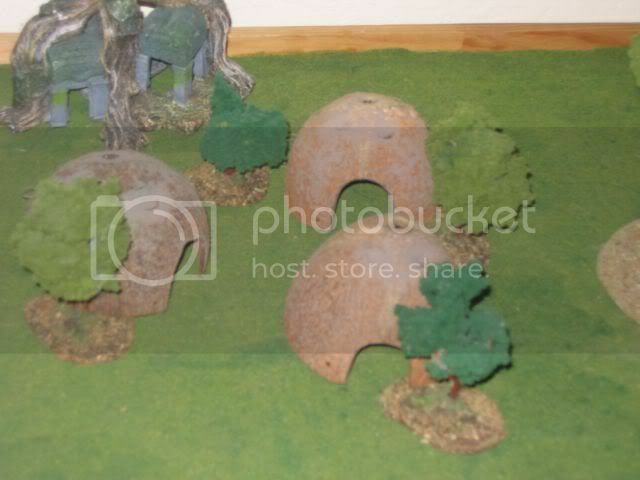 The second photo has the grass bases a little too dense in the middel, they are movable. 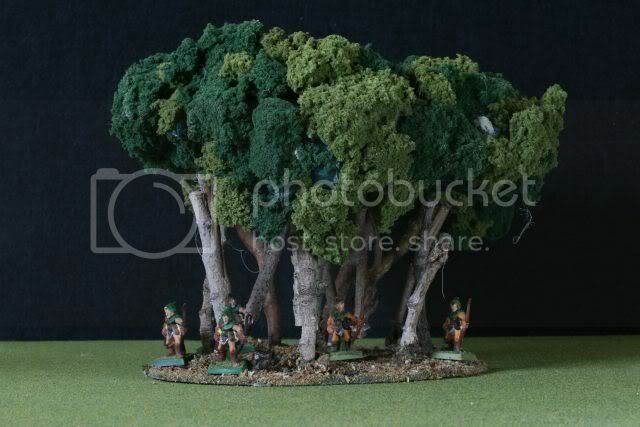 Here is my Free Wood, the trees are on magnetized bases, its built on a metal plate. whenever i try to post any kind of pics with the upload feature, or any URLs for that matter also, i get a blank screen... does this have anything to do with Asrai.org? Ryikko wrote: Ach! My damn computer! 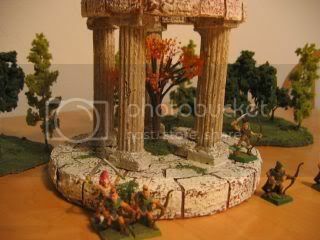 I have list for around 10 regions around war hammer world, this system has worked great for our group for over 3 years. 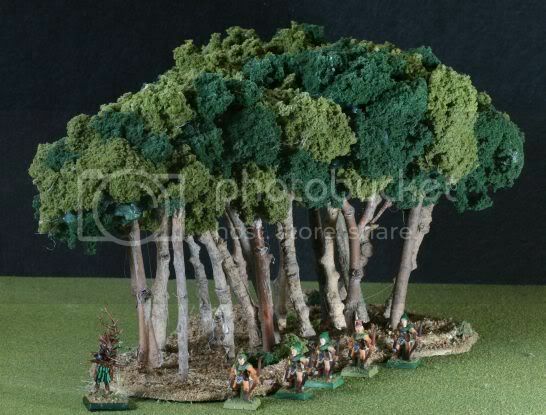 you will notice that there are no true woods in the Scarce category, and only one (spite grove) in the unique so your opponetents may very well appreciate the fact that you will likely get less woods on the table then if you used GW's Method (and you were insitent on placeing trees) I try to ballance the them locals so they give some "home field advantage", but that it is not overwhelming. Just a quick note on the blank screen. if you upload big images (like the ones most cameras produce, some 3500x2800 pixels) the upload feature will fail. However, the error page doesn't seem to work properly. The whole thing probably times out due to the incredible size of the picture. Size it down to 1000x760 for good results. I love the Romantics stuff (nature reclaiming buildings) but good job on all of it!!! How nurgle loves his little pretties! How Nurgle loves his little pets!" 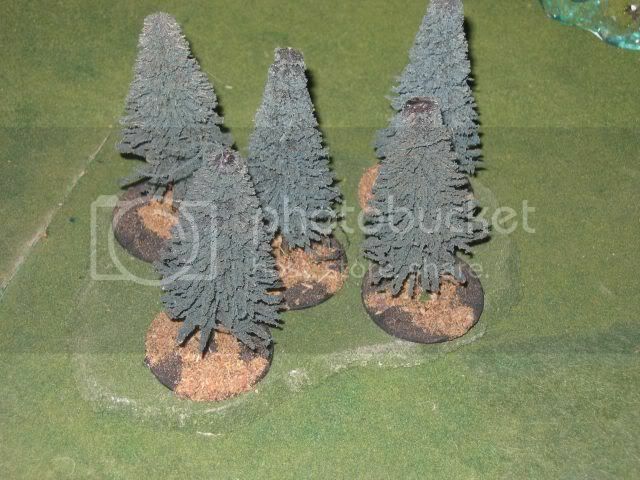 Those look great Ryiokko, I like the Dwarven pieces, I need to add some more dwarven scultptures and such to my Mountain terrain set . ..